This is the final apples from those few I picked the other day. I got a batch of apple/pear fruit leather out of the dehydrator this morning, packaged it up and stuck that in the freezer. 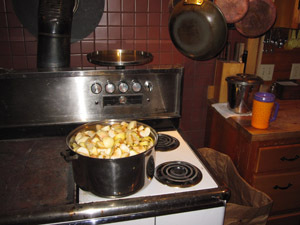 The batch on the stove right now is destined to become apple sauce, which I then hope to convert into apple butter. We made a test batch of it two years ago during our last good apple year, and it was really tasty. The only hard part about apple butter is that it takes 6-8 hours of baking in the oven, which means you kind of have to hang around and stir it now and then. 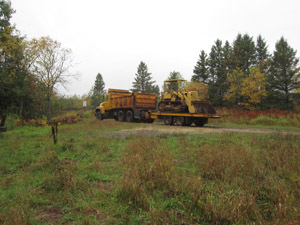 We hauled the dozer to the repair place on Monday. It looks pretty sharp sitting on the trailer, doesn’t it? I’m lucky that an expert in vintage Allis Chalmers bulldozers works just about 10 miles from here. I hired my neighbor and his truck and trailer for the trip there and the trip back once it is done. This entry was posted on Thursday, September 29th, 2011 at 11:45 am and is filed under Uncategorized. You can follow any responses to this entry through the RSS 2.0 feed. You can leave a response, or trackback from your own site.